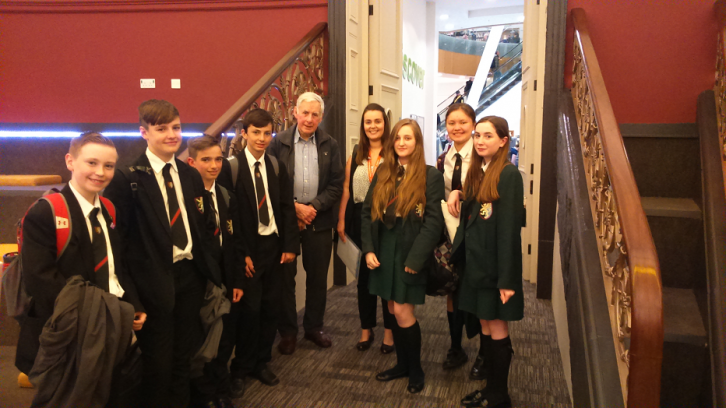 On Thursday 27 April 2017 I welcomed a group of Year 9 students and staff from Cowley International School to Liverpool Record Office. Liverpool St Helens Heritage Project Director Ron Hall spoke to the students about the unique nature of Liverpool St Helens Rugby Club; namely the formation in 1857 and its acknowledged status as the world’s oldest open rugby club. Ron then went on to highlight the strong links between Cowley school and the club. In 1919 St Helens Old Boys was founded by a number of former Cowley pupils. Additionally, Ray French, current Liverpool St Helens Club President, was a former pupil and teacher at Cowley who went on to become Head of Rugby at the School. Ray played for both rugby codes and is a dual International player. Cowley Staff and students were then given a behind the scenes tour of Central Library and the Record Office by Jan Grace, Archivist and myself. The tour included a visit to the cold storage specialist media area, where the photographs are stored. After seeing where the archive was kept in this vast repository it was time for the students to gain some hands on experience. In the professional Conservation Studio students were given the opportunity to carry out some preservation work. After donning the white gloves, the students were tasked with repackaging original photographs from the 1920s into polyester pockets. Next, students were able to see my work area and learn more about the tasks I have been engaged in most recently; from scanning items to illustrate our booklet on the history of the club to checking boxes of match day programmes for duplicates. I was also able to speak to the students about our planned exhibition and the ways in which we can work together to create something family friendly and fun. Watch this space for more details!